An apple pie with just 6 tablespoons of butter? It does exist. This (almost guilt free) apple pie is so delicious you can’t even tell it’s so much healthier than any other apple pie you’ve had. 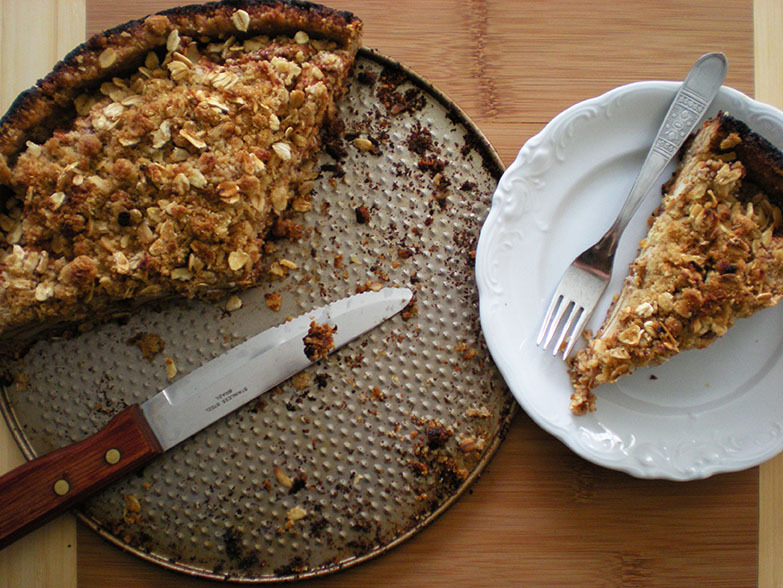 The crust is made up of almonds and oatmeal and it’s sweetened with honey. I ground the rolled oats and almonds in a blender myself, but you can also use ready almond flour and oatmeal flour. 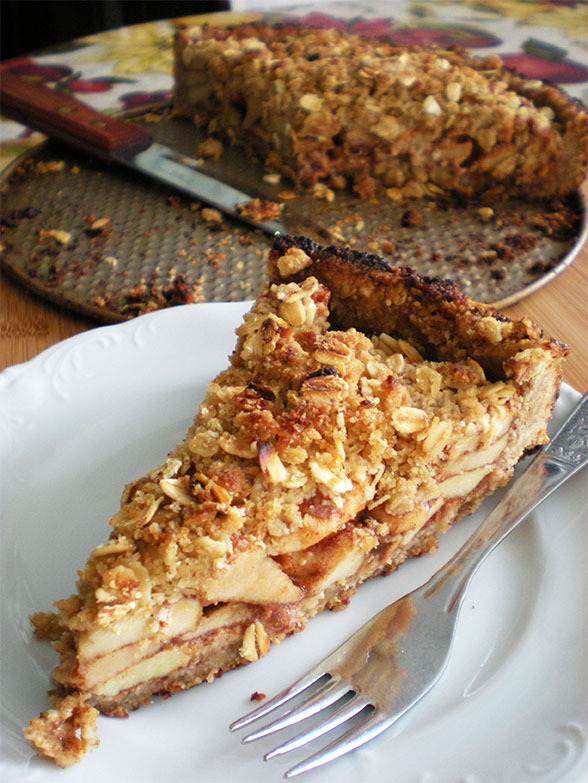 This crust is the perfect amount of crumbly and moist and it goes so well with the warm, soft apples. The sweet crumble on top is enough garnish for me, but it won’t hurt too much if you have it with a scoop of vanilla ice cream or a dollop of whipped cream. This pie is much easier to make, thanks to the crust, and it makes the house smell amazing. Pre-heat the oven to 350˚F and oil a 10 inch round pan. In a large bowl, mix 2 cups ground almonds and 2 cups ground rolled oats. Next, add 4 tablespoons of melted butter and mix well until you have a crumbly mixture. Add in 7 tablespoons of honey and 2 teaspoons of vanilla extract and mix until fully incorporated. Place the crust mixture into the prepared pan and press it onto the bottom and sides of the pan. Don’t spread the crust all the way up the sides of the pan. Leave about 1 inch. Bake just until air pockets start to form on the crust. About 5-10 minutes. Make sure to keep an eye on it since every oven is different and you don’t want to fully cook the crust just yet. Wash, peel, core and slice 6 apples. Throw them into a large bowl and sprinkle with 6 tablespoons of granulated sugar and 2 tablespoons of cinnamon. Toss until the apple slices are covered. Next, juice a lemon until you have 1/4 cup juice and pour over the apple slices. Sift in 1 teaspoon of cornstarch. Toss to combine. Place the apples into the prepared crust, leveling them out to fit. For the crumble, mix 1/2 cup ground rolled oats with 1/2 cup whole rolled oats. Add 4 tablespoons of brown sugar to the oatmeal and mix. Pour in 2 tablespoons of melted butter and mix until you have a crumbly mixture. It should be more on the dry side. Sprinkle evenly over the apples, covering them completely. Bake at 350˚F for about 15 minutes, or until crust and crumble is golden and apples are fork tender. Delicious! I swapped out the cinnamon and lemonjuice for allspice and orange and it worked out a treat! Thanks for the great recipe! Thanks for stopping by my blog! Your Apple Crumb Pie looks so yummy. I could totally have that for breakfast! Thanks for visiting my blog and I’ll have to come eback here and try a few of your recipes out. Thank you for dropping by my blog as it made me discover yours! What a delicious recipe! OMG! It’s like an apple crisp on steroids! I’ve got to make this, my father in law will love it!!! Haha that is is! Enjoy! Wow, this is delicious! Love the oatmeal and almond crust! I hope you don’t mind that I reblog this on my reblog tastings page? Look at all those layers of apple!!! That looks like such a gorgeous pie and the crust sounds so hearty but healthy and delicious. I’ll have to give this a try! Beautiful pictures. I love the look of the oat crumble topping. What a healthier version of the one I usually make ..Thanks for sharing!